If you own a Fire TV or a Fire TV Stick, there’s one accessory that you absolutely need to get. It’s called the iPazzPort Mini Bluetooth Backlit Keyboard with Infrared Learning Universal Remote Control. That’s certainly a mouthful, but it will be the best $25 you’ve ever spent. This tiny device attaches to the back of your Alexa remote and adds a full QWERTY keyboard that’s backlit so you can see it even in dark rooms. On top of that, there are eight programmable buttons that you can use to control your TV so you never have to touch another remote again! 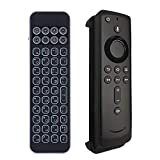 [ IR Learning Functions ]-Bluetooth mini keyboard with IR learning buttons for amazon fire stick、fire tv and fire tv cube. Make the type and search much easier, control the basic functions of your tv(Power、Source、Volume+-、Right and left), all in one remote control.Search “iPazzPortfans” on youtube to get video tutorials.Note: FIRE STICK REMOTE NOT INCLUDED.